Senators expected to receive the FBI’s highly anticipated supplemental background check on Brett Kavanaugh late Wednesday, opening the final chapter of what has become a deeply acrimonious confirmation battle. Senators may be able to discuss what’s in the document but it isn’t clear whether a copy of the full report, or a redacted version, might become public, or if so, when. Ford’s attorney said on Wednesday afternoon that she still wished to talk with FBI investigators but hadn’t, and told Senate Judiciary Committee Chairman Chuck Grassley, R-Iowa, that Ford had supplemental documents to give the FBI. Democrats are expected to cry foul about an investigation that omits Ford and Kavanaugh; Republicans may take the position that they’ve already talked extensively with the Senate and the public in their open hearing last week. The president also poked fun at Ford’s recollection of details about the episode, including how much she drank and where the party was located. Three undecided Republican senators criticized the comments Wednesday as unhelpful and distasteful. Sen. Susan Collins, R-Maine, addressed Trump’s comments in a brief talk with reporters camped outside her office. “The president’s comments were just plain wrong,” she said. Trump’s comments come at a time of intense political division in Washington. The Senate has descended into direct partisan attacks and personal animus as the country grapples with serious questions about how to handle allegations of sexual assault. Some lawmakers say they worry the political fight over Kavanaugh’s nomination is melding with the broader #MeToo movement in a way that could politicize the discussion of assault in general. Retiring Sen. Bob Corker, R-Tenn., is among those who say the Senate’s handling of the allegations against Kavanaugh has created an impression that the issue of sexual assault is itself political. It’s not uncommon for partisan battles to intensify this close to a midterm election, but many senators from both parties say the anger over Kavanaugh is approaching a new peak. Vermont Democrat Patrick Leahy, the longest-serving current senator, said the mood in the Capitol is among the worst he has seen. Sen. Lindsey Graham, R-S.C., blamed Democrats for politicizing Kavanaugh’s confirmation process and passionately defended Trump’s nominee at the confirmation hearing last week. He predicted the Supreme Court nomination process would be forever changed — there would be a “before” Kavanaugh and an “after” Kavanaugh for those seeking federal office or a judicial appointment. The fight over Kavanaugh has also sparked passionate debate with voters across the country. 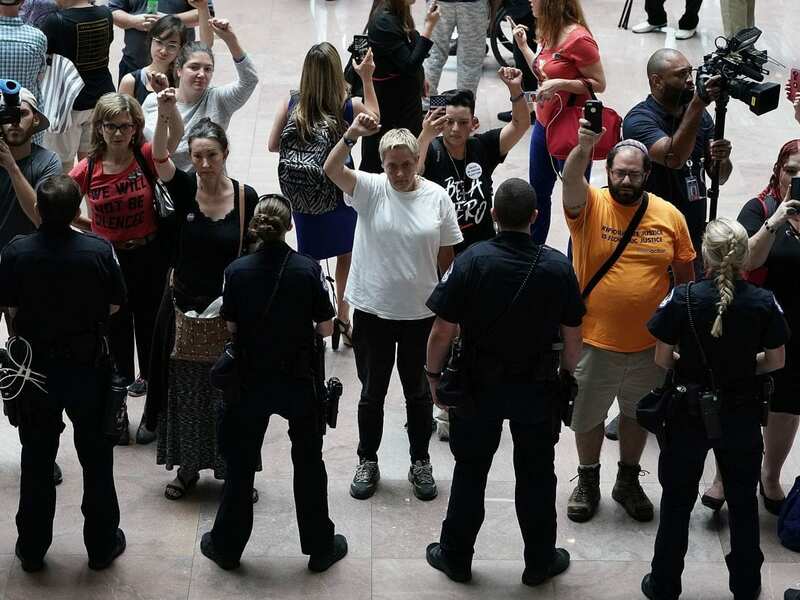 Protesters are flooding the halls of Capitol Hill to confront lawmakers, showing up in restaurants where senators are dining and waiting for their planes to land at Washington’s airport. The protesters are credited with helping influence Flake’s decision to call for the supplemental FBI investigation that is currently underway. Ana Maria Archila and Maria Gallagher, two activists opposed to Kavanaugh, approached Flake in an elevator last week, just after he announced that he intended to vote for him. NPR’s Tim Mak contributed to this report.